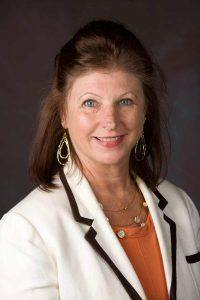 Marrianne McBride, CEO Council on Aging, is a 2012 recipient of Northbay Business Journal’s Nonprofit Leadership Award and Council on Aging was chosen by North Bay Biz magazine as the “Best Nonprofit” for 2013. In addition to running Council on Aging, with a budget of $4.8 million and 75 employees, Marrianne is a seated member of Sonoma County Health Action and has been chosen as one of a five member team from Sonoma County to the 2014 National Leadership Academy for the Public’s Health to create a “Healthy Aging” plan for Sonoma County. President Mark opened the meeting at 12:30 with the clang of the bell and the lively chatter among Rotarians halted. Chip Rawson led us in the Pledge of Allegiance. Casey D’Angelo then gave us the thought for the day which was to give practical examples of carrying out the third part of the 4 Way Test: Will it build Goodwill and better friendships? People are often unreasonable, illogical and self centered; Forgive them anyway. Give the world the best you have, and it may never be enough; Give the world the best you’ve got anyway. You see, in the final analysis, it is between you and your God; It was never between you and the anyway. Don McMillan introduced the Visiting Rotarians Past District Governor Mike Merrill from the West Santa Rosa Club and Asst. District Governor, Ann McGinley from Santa Rosa East Club. He then introduced our special guest and today’s speaker, District Governor Kevin Eisenberg and his wife, Mary. Our guests for today were: Courtney McGee, Laura Held, and Michael Wilson. Eileen Carlisle gave our sunshine report stating that our former club member, Judith Hall, died recently. Judith was a member of our Club from 1996-2010. There is no information at this point about a memorial or services. Debi Zaft scared all the Past Presidents by asking them to stand and be ready to answer the Rotary Magazine question. Then she had a brilliant idea and let them off the hook and called on our District Governor to stand and answer the question: What country has now been declared polio free? DG Kevin not only got it right, India, but he went on to give a very impressive paragraph or two about the achievement. Karen Ball gave a very interesting one-minute briefing about her Pronoeo Insurance Agency. It is a full service company in which Karen shops the market for the most suitable insurance for her clients. She handles home, auto, health, life or whatever kind of insurance the client needs. 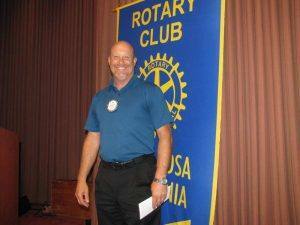 Our Rotarian of the Month is a relatively new Rotarian, having joined our club only last year. Yet he has jumped in with both feet, and was a major contributor to the success of our Giro Bello. When Doug Johnson set a sponsorship goal of a 20% increase over last year, that was quite a challenge. Yet our Rotarian of the Month stepped forward and lead the Sponsorship subcommittee of the Giro Bello to achieve a total of $25,500 in sponsorships. This was no easy task. It took vision, dedication, and a lot of hard work. 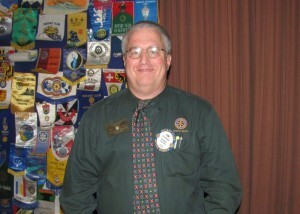 I am happy to name our July Rotarian of the Month: Ray Giampaoli! Prez Mark is doing something a little different this year. The Rotarian of the month receives a not only a restaurant certificate but also a “Rotarian of the Month”pin. So, after awarding Ray his certificate and pin, Mark also gave Peggy Soberanis a pin for receiving the honor last month. DG Kevin had the privilege of inducting two new members in our Club: Laura Held and Mykha’el Wilson. He praised the sponsors for choosing people who would fit in with the Club’s goals and ideals; and he praised the inductees for joining such an active service club. He handed Laura and Mykha’el a packet and explained its contents. The Red Badge is to be worn until the obligations of the Red Badge are fulfilled. Then it can be traded in for a Blue Badge. The Rotary pin is a symbol of your dedication to service. Wear it always and be ready to tell others why you are a Rotarian. In the packet there is also a guide to service and the 4 Way Test. The Club members gave a standing ovation to welcome Laura and Mykha’el into the Club. Tim Fawcett – 18 years of perfect attendance! Debi Zaft – 18 years – and Jack Abercrombie – 13 years! President Mark gratefully thanked the 25 Club members that attended the DG social at St. Rose’s Tuesday evening. Out of 58 attendees, our club provided 25! We looked good! 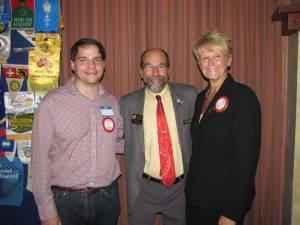 The next SCARC (Sonoma County Area Rotary Clubs) meeting is August 28th at Sally Tomatoes. The theme for the evening is Fundraising. All are welcome. Cost is $45. Reservations are required. There were colorful page announcements of all upcoming Rotary events and activities on each table. You can view/download a copy here: Color Block Schedule. Don McMillan announced that the SignUpGenius is now in place so Rotarians can go online and see what volunteer deeds need to be done and hopefully, sign up for some tasks for the Pillow Fights. Cathy Vicini encouraged members to donate their Rotarian Magazines to their doctor’s office, dentists, hair salons, etc. It’s a way to market what Rotary does. Kathleen Archer returned from a trip to Maryland where her daughter, Erin, was taking her state bar exams. Kathleen brought back some gifts for Prez Mark to be raffled or auctioned off at the end of the year. Asst. DG, Ann McGinley introduced our guest speaker, DG Kevin Eisenberg. He is a graduate of UC Santa Cruz. He met his wife, Mary, there. They both became teachers and taught in the LA schools. Later they moved to Calistoga where Kevin was principal for 13 years in an elementary school and then 5 years in a middle school. At some point he was awarded the Teacher of the Year. Kevin’s theme for the year is “the Pride and Joy of Rotary”. He is extremely proud to be a Rotarian. He is proud of our 4-Way Test as our ethical standard. And the joy comes from the service we do for others. Before our luncheon meeting, Kevin met with the Club’s Board of Directors and asked each one what gives them pride and joy in Rotary. He was so touched and inspired with their enthusiastic and heart-felt responses. Because of that Kevin asked all members to be able to articulate what gives each of us pride and joy in Rotary. Share our pride and joy. He challenged all of us to wear our Rotary pin at work, when we’re out and about. 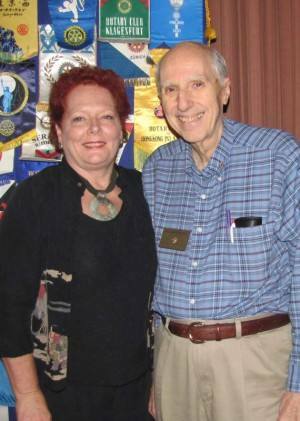 The pin often starts conversations about Rotary. When we wear our pin we are representing the Rotary Club and its 4-Way Test. Polio eradication is one of the most successful projects that Rotary International has addressed. We are truly so very close to eradicating polio forever. Since we are the beacons of life and light, let us participate in the club’s projects, in the international projects and help Light Up Rotary! President Mark thanked Kevin, gave him a Rotary clock, thanked the meeting helpers and adjourned the meeting at 1:30 p.m.